The name Norn (plural Nornir) refers to an entire race or tribe of beings who weave the fates of mortals and gods alike. 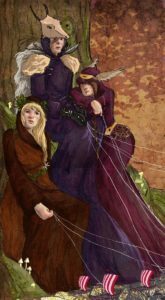 Often, when we talk about the Norns, we are referring specifically to three Nornir who figure prominently in the Norse myths, and who watch over the Well of Urðr (the Well of Fate). Urðr, Verðandi, and Skuld are the names of these three women, and they each rule an aspect of time – past, present, and future. 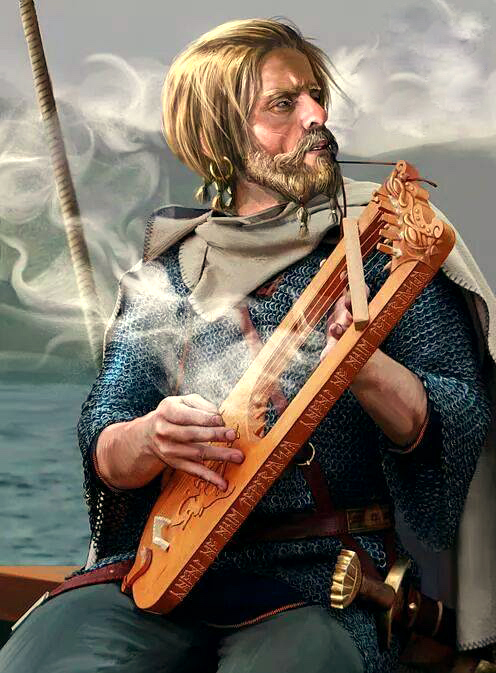 The Nornir are attested in the Prose and Poetic Eddas, Skaldic poetry, and some of the legendary sagas, as well as surviving runic inscriptions and the Franks Casket, an archaeological treasure made of whalebone from the eighth century. Parallels to the Norns can be found in many other cultures of the time, such as the Fates popular in other European mythologies. It is not clear overall whether the name Norn denotes a race, tribe, or profession. Most stories declare that they are Jötnar, but their origins are never recounted. Frigga is described as a Norn, and as the child of two Jötnar, Fjörgynn and Jörð, this is consistent with the theoretical racial identity of the Nornir. There are many, many other Nornir mentioned in the lore, and there appears to have been a Norn assigned to each individual person, each family, or each tribe. They are described as being present when children are born, to weave the newborn’s fate, and it appears that whatever the Norns decide is unchangeable and inescapable. In the case of Urðr, Verðandi, and Skuld, the Nornir most referenced in the Eddas, and best known to the Æsir, were in charge of caring for the World Tree, Yggdrasil, and ensuring that it’s branches did not rot, and that it was well fed from the Well of Urðr. They were not only consulted by the gods for sage advice and questioned as to the fates of various characters, but they were responsible for the health and well-being of the entire nervous system of the Nine Worlds. They were the CEO’s of the Cosmos. To make the Nornir more confusing and mysterious, there is no clear distinction between them and the fylgjas (a spirit of luck), hamingjas (a spirit of luck associated with a family or kinship), valkyrjur, or with the dísir (female ancestors). To be fair, though, many gods also straddled several classifications – such as Frigga, who was associated with the Æsir, Nornir, and dísir. Several valkyries also were Jötnar, human, fylgjas, or hamingjas. They also seem to have been exclusively female, in contrast to the Dvergar, who were almost exclusively male. These messy overlaps seem a bit sloppy and confusing to us, as modern readers, but we have little way of knowing what the intent was at the time the myths were being passed along. As a modern society as a whole, we seem to like things, in general, to be well classified, identified, and stamped as “known” – but the Norse myths, just as in real life, contained many gods and personalities which overlapped, and managed similar things. Just as there were good and evil races and characters in the mythologies, Nornir could be good or evil as well. Or rather, in the broader perspective of All Time, our limited viewpoint (as humans with short life spans) made it seem as though specific Norns made rather malevolent or benevolent choices when setting the fates of some individuals and even entire families. In the end, we are led to believe that the fates woven by the Norns are without reprieve and we are not allowed the luxury of questioning them. Fortunately for us as readers, and for the ancient Norse as storytellers, we get to see the beginnings and endings of many great heroes and enduring dynasties, and whether or not they fell on hard fates or achieved great feats, they have lived on to inspire many generations of heroes, adventurers, and everyday people. In the end, it seems that the Nornir have perhaps conspired to inspire millions upon millions of us, from ancient times all the way through to the modern age! Looms, spindles, and other weaving tools. Any symbols of fate and destiny, including personal signs of Divine guidance or cledon.